Vahni moderated "The Business of Blogging" panel with Gucci's Caitlin NiChathain, Post Fashionism's Tony Wang, Halogen's Gregory Shove, Refinery29's Piera Gelardi, Altamira: Models of Duty's Craig Arend and Keiko Lynn's Keiko Groves. I'm back from the IFB Evolving Influence Conference and have finally had time to unpack and process it all. What can I say? It was wonderful. There I was at New York Fashion Week, at Milk Studios even, surrounded by inspiring creative talents who just happened to be some of the most fashionable people I'd ever come across. While I struggled just to plan outfits in time for my Bolt Bus departure, somehow Lynzy of Sparkling Footsteps had it together enough to plan a conference pre-party at the Ace Hotel. After scarfing down some sushi and sake with blogger pals, I headed over to the Ace with Lani of Mon Petit Chou Chou and met up with Marissa of Taste & Style Files, Vahni of Grit & Glamour and Lee of Lee Oliveira (who has the most adorable Brazilian/Aussie accent). If my Internet friends become friends in real life, does that make me less of a nerd? Thursday morning found me hobbling four crosstown blocks to Milk Studios in four-inch heels after failing to hail a cab. Maybe it was all the Fashion Week adrenaline keeping the pain at bay, or maybe the fabulous people watching opprotunities in that room had me distracted, but I didn't even feel it. A blogger being measured for free Levi Curve ID jeans. Apparently, I'm a "Demi Curve." Boyfriend was disappointed to hear I'm not a "Sassy Curve." Aldo previewed an awesome new collection of designer collabs. These bad boys are by Julian Louie. More to come on this. I found Sasha's perspective particularly relevant (she would say "germaine"), as so much discussion of fashion blogging seems to center around the clout of personal style bloggers. According to Sasha and the other panelists, seperating your personal image from your blog is not an inherent roadblock in working with brands. Well, that's a relief, because I do not plan on jumping in front of the camera any time soon. I paired the coat with a leather paneled skirt from Pinkyotto, a cropped All Saints sweater over a black tank, and some black patent Stella McCartney booties I found at a sample sale a couple years ago. The bag is a vintage Bottega Veneta that also belonged to my Grammy. Yeah, she gets the award for most stylish grandma ever. Great story about this coat: Grammy and her twin sister got matching Somali leopard coats for their high school graduation in the late '30s. Now my cousin and I have them and are planning to traipse around Manhattan in them looking utterly ridiculous and trying to avoid PETA's wrath. Anyways, hope to see all you bloggers at the next IFBCon! The Proenza Schouler boys gave the key-note address. Excuse the crap photo; I was star stuck. It was indeed a good conference content wise, so much to take in! Pleased to have met you! lady it was so lovely to meet you!!! i adore the photo above and am SO glad you wore the leopard!! that's a fabulous pic of all of us!! amazingggggg. and i love your coat even if an oversized kitty had to give it's life for it. OMG, the COAT! How did I not see it that day?! Delish! So lovely to meet you, hon. See you again soon, maybe?! V, I certainly hope so! Such a gorgeous coat! You look fabulous!!! I hope you enjoyed meeting everyone! I hope that maybe one day, you guys can all come on over to the sunny shores of Athens or maybe one of the islands?! Ohhhh dear! Everything sounds so wonderful! Hopefully I'll make it next time (gotta start saving up now lol) P.S. Your coat is dreamy!! IT's so fun that you went to this! Hope you had the best time ever! Thank you for getting over your camera-shyness and posting a pic of yourself. 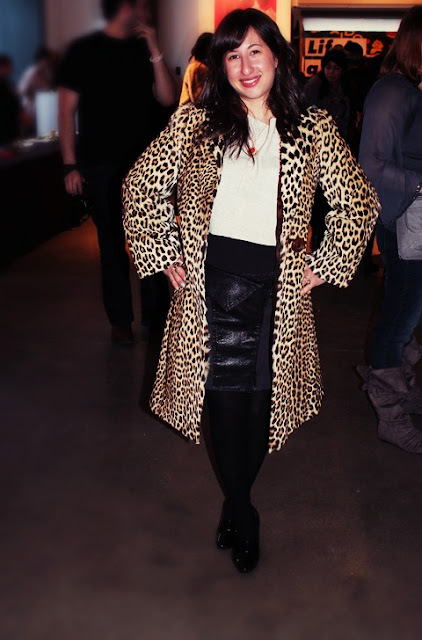 That coat is beyond words, words fail to express the badassery of a vintage leopard coat. Gum. Sheesh. Uh. I really wished I could have gone, and met you and V and Lee and Kristy, among others, but really you crazy bunch- hee hee. I am glad that there is this powerful community and that there is more than one way to blog, or to put it in gma's coat parlance- more than one way to skin a cat. I am still trying to process all the info we culled from IFB, totally overwhelmed by ideas, fashion, and things I need to do, coupled with my complete and utter lack of time. PS, you need to break that coat out more often. Boston is ready for it. Totally agree with Lani. If I owned such a gorgeous coat, I would probably never take it off! Lovely to meet you! Hey there! It was great to meet you at IFB, your coat was my fave. Your blog is tops, adding you to my reads and sidebar! And hey, don't feel bad; I'm a "slight curve" when I was thinking I was around a Bold, how sad! Bummed that I missed out on saying hi to you and Kinsey! You look great and I love your Gram's coat!! Thanks so much for the recap...it sounds like the conference was highly informative AND you got to meet other rad bloggers. There are some great friendships to be found in the blog world!! I'm so sad I missed you at the Ace hotel meetup - I got held up by work things and couldn't make it. It sounds like IFB was really informative. And exhausting. I hope to catch you the next time you're in the city!!! So glad you posted a picture of yourself in that coat. OMG - your Grammy had style. It looks as good as new. Beautiful coat! you should feature more pictures of yourself!! I love this post. So cute. It was nice of you for posting your picture. I hope that beside the IFB conference that you also took time to enjoy NY. It is the best city in the world. LOL.